Like many people in Frisco, I love – and sometimes just plain need – a good cup of coffee. Americans spend an average of $13.6 billion on coffee per year and that number continues to rise. A study in 2015 showed the American worker spends about $16.40 a week on coffee, and that number is likely to exceed $21 per week in 2016. Starbucks, Dunkin Donuts, local coffee shops, and at every gas station, people are stopping multiple times a day to get their fix. So when news broke of a cool coffee shop coming to the Gearbox building, I couldn’t be happier. 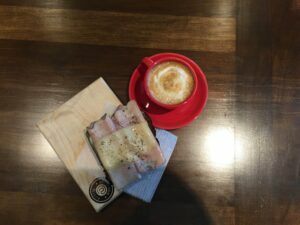 @Nervdana is a coffee shop concept dreamt up by the creative minds of Kristy Pitchford and Executive Chef Mike Junio. @Nerdvana had their ribbon cutting ceremony in July and the energy from the staff, residents and the owners is exciting. When you step inside you know you’re in a coffee shop, but not the typical coffee shop that we all have been going to for years. You’re in place that has a city vibe with tables, benches, classic tabletop games, and outlets everywhere for any device you need to keep charged. The idea of the coffee shop was relatively new, said Pitchford. The name @Nerdvana came after many ideas were bounced around back and forth. The shop has a pretty large seating area for patrons to enjoy a break from work, or to play one of many tabletop games. I can tell you first-hand..they do. If you’re looking for something to go with your coffee, rest assured, Chef Mike Junio knows what he’s doing. Artisan Texas Toast recipes and fresh pastries from Millstone Bakery will get your day started off right or provide an excellent afternoon snack. Since visiting on opening day I have made @Nerdvana a part of my daily ritual. 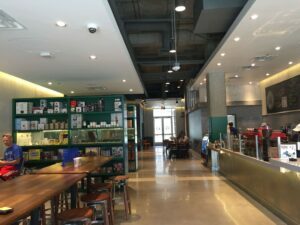 The staff, coffee, and environment is a breath of fresh air to the city, Frisco Square, and the coffee culture in general. For a bit of added fun, check out the Coffee Ripples app (iPhone and Android). You can even get your mug printed on your cappuccino! If you’re looking for a great place to get some work done, look no further. Their Wifi speed tests (on mobile devices only) gave us 80-90MB up and down. Grab the wifi code from the bottom right of the blackboard when you walk in. @Nerdvana does have something for everyone and they are continuing to add some very cool things to their plate such as a podcast booth that overlooks the entire shop. You can buy games, check them out, and learn to play them while there. If you are tired of the same old choices and want something different, stop by and meet the staff. Chances are, I’ll be there sitting at a table “working” – just ignore the game in front of me!